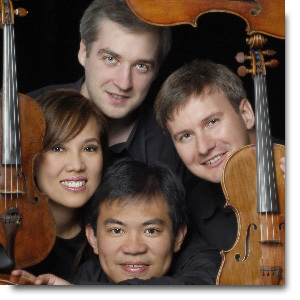 This quintessential string quartet with iconic John Stetch on the piano merited a standing ovation after their one-hour concert. Impressive was Borealis, especially Patricia Shih who swayed emotionally as she played the high strings of her violin, her hair flowing with her head movements, her legs apart, lifting her feet as she reached high notes, face full of expression, playing in harmony with the other strings, giving Shostakovich's String Quartet No. 8 in C minor, Op. 110 a near perfect delivery. Then John Stetch, innovative, creative, an iconic figure in Canadian music, plays the muffled low-keyed and lyrical Lute Song, and follows by playing not only the keys but also the strings of the piano, delivering his Black Sea Suite, a reflection of the colours of the Slav culture surrounding the legendary sea. The climax of the concert was Stetch together with the quartet delivering Stech's own Xmusing, an inspiring piece in four movements: 3-Stroke, Bluesealis (partly named after the Borealis Quartet), Fugue (giving us a sensation of frenizied flights), and Heptagonal which, according to the composer, "is written in 7/4 time and features some schizophrenic accents and ostinatos". The encore, Tango por una cabeza by Carlos Gardel and Alfredo Le Pera, was well-received to the delight of this Musicfest audience who clamoured for more. But the house lights came up, signalling that the show was over. The almost full-house audience left Christ Church, feeling satisfied, as though saying "It was worth the money!"